Subject: Femoral nonunion and ? 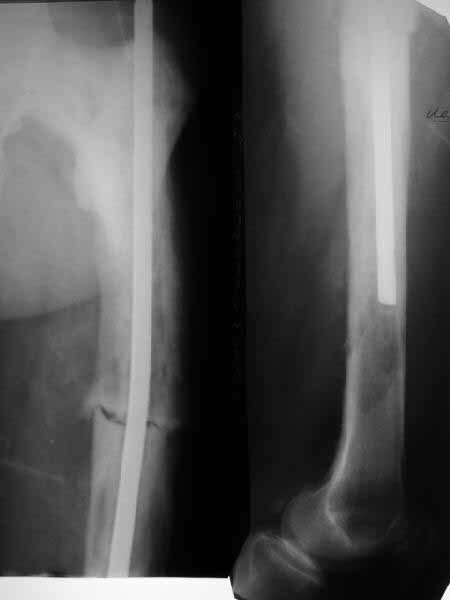 A male 76 years old sustained femoral shaft fracture after minimal injury. Open reduction and intramedullary nailing was performed somewhere else. He was refferred to us with pain in the femur and sense of movement at the site, especially with rotation. Xrays revealed except nonunion some bone structue changes. What is this? Isn't it Paget's disease? We plan to perform exchange closed locked nailing. How the bone status should influence the plan? Either use a small diameter nail without reaming at all or it would be no problem to ream to 11-12 mm? I believe its Pagets. The bone looks larger than normal, along with coxa vara, which is characteristic. Check his alkaline phophatase. In rare instances, you can see aggressive lytic disease (unlikely here), which requires medical Rx to quiet down. Get out your reamers, and put a big nail in him- the biggest his canal will take. Make it longer, and lock if you don't believe the fixation is snug. From the appearance of the x-rays and the description of a fracture after minimal trauma, I would be very concerned about a neoplastic process. Odds would favor something metastatic and appearance might suggest a combined blastic-lytic lesion. I am particularly concerned about the lytic appearance distal to the end of the rod. I would work up the patient for both neoplastic and metabolic process before proceeding. After diagnosis treatment options can be considered. Dying to know what this is. Check serum Calcium,Urea and Electrolytes and Ak Phos.Pagets may be in active "lytic" phase. Aim to use a strong reamed locked nail,as the femur is bowed and union may be slow. Be prepared for greater than usual blood loss. I think I will add my few thoughts. In case this case is Paget's, be prepared for a tough time during reaming. Bone tends to be hard and reamers may be found wanting in efficiency. Hence keep an option for plating in case re-nailing turns out to be a tough proposition during surgery. Best of luck and do keep us posted on what you do. THX to all colleagues for their opinions. Chest xrays are clear. Our radiologists explored films and swear the bone changes are Paget's. Finally we proceeded with a minimal plan - the existed nail was pulled out (quite easily). It turned out that a largest available nail was only 11 mm 40 cm, so i inserted it and locked dynamically. The procedure was quick. As immediate effect the patient marked lack of clicking which disturbing him before. We plan to discharge him ASAP with recommendations of biphosphonates etc. It looks like Paget's disease to me. The original nail is small, short and unlocked. Make the second one reamed, large (14 mm), long (past the distal lucency) and statically locked for rotational control. Send tissue for pathology.